HomeSmartphonesIs the tag line-Galaxy Note 5 vs Galaxy S6, True! Is the tag line-Galaxy Note 5 vs Galaxy S6, True! Many of the users may certainly have seen a tagline embedded with the recently launched smart phone models from their same brand Samsung. After seeing it many of you would have reacted- Is the tag line-Galaxy Note 5 vs Galaxy S6, True! What do you think is it true? Can you just think that Samsung would have created certain conflict in between the two new models and allowed you to get confused in the term Galaxy Note 5 vs Galaxy S6? Many of you would say yes and similarly some of you may say no, but what is the fact that wonders you to think so. The tagline Galaxy Note 5 vs Galaxy S6 certainly doesn’t mean by any way. Both are nearly of same pricing range and similar features and specs but with somewhat Note5 have a bit more operational features and in size even it differs a bit. As per your requirement you could grab any of the models mentioned. Galaxy Note 5 vs Galaxy S6 certainly doesn’t need to be hiked. The below mentioned features will let you know the least difference in between the two models. The first distinguished objective in both the models is the type, Note 5 is categorized as Phablet and S6 model is categorized under touch screen smart phone. Both the devices launched this year officially. The so called Phablet launched in the month of August which is the most recent launch from the brand and the S6 model launched in the month of April a bit earlier than the Phablet. As we all know technical evolution and invention had have foot-marked its progress in a regular basis. So does the models do, with every invention the brand evolve the old model with latest technical support and availability. This progress is en-marked by the Samsung brand relevantly showing its progress in the trade of smart phone devices very effectively. As the type differs, Samsung has incurred certain differences in both the models. After the type categorization secondly we can differentiate with the dimension category- height of 153.2 mm, width of 76.1 mm and thickness of 7.6mm, weighing 171 g the Phablet is a bit more ahead than the S6 model with dimensions of 143.4 mm x 70.5 mm x 6.8 mm respectively, weighing around 138 g. now at third comes the display of Quad HD Super AMOLED incurred in both devices, the Note 5 with a display of 5.7 inches has a resolution of 518ppi whereas the S6 with a display of 5.1 inches has a resolution of 577ppi. Then comes the battery, Note 5 has 3000mAh non-removable battery whereas the S6 has 2550mAh battery which is removable. The Note 5 has been defined with a RAM of 4GB whereas S6 incur a RAM of 3GB. All other factors or prescribed features and specs are mostly same in both the models, Like CPU, GPU, Operating Software, camera configuration etc. either of the devices incur exactly the same configuration as the other one. So you just stay calm and decide your choice and grab one of the models as per your need. 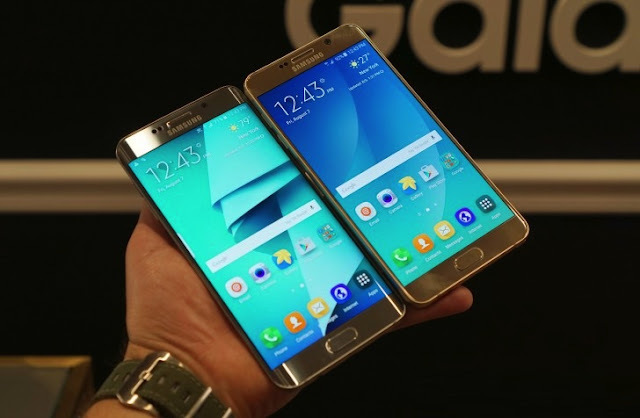 Don’t get confused in the term Galaxy Note 5 vs Galaxy S6.